Fungi base features are important. 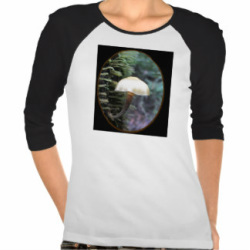 Checking out a mushroom base could be a life saving action. For instance, most deaths by mushroom result from mistaking the death cap, Amanita Phalloides for edible lookalikes. The Death Cap grows from a volval sack which can be seen at the mushroom's base, perhaps rather torn, but still evident. Most mushrooms with a sack at the base are poisonous. Stem base Diagrams by Hannibal's back - Own work. Licensed under CC BY 3.0 via Wikimedia Commons. A fungi stem base that is growing out a sack or sock is almost always unsafe to eat. The sack is called a volva and it is the remnant of a veil of mushroom tissue that completely covered the mushroom cap in its infancy. As the mushroom grows the cap breaks away from the base leaving either a torn or fairly even volva. Amanita mushrooms have this type of sack at their base and all except one or two are unsafe and even deadly. Australia's Cortinarius Australiensis looks rather like an edible horse mushroom until you notice its arrow headed base and the bright rusty coloured remains of its cortina on the stem. When mature its gills will be rust coloured, a sure sign that it is a poisonous web-cap so don't be tempted. A Fusiliform base involves a long root that is often attached to buried wood. FungiOz app includes several elegant Australian mushroom species with this form. This is the type of volvul sack from which the Death Cap mushroom grows. The sack is large and floppy but may not be intact. Though not always the case, you should suspect that a mushroom with a scaly swollen base is an Amanita, with the scales being the remains of a volvul sack. 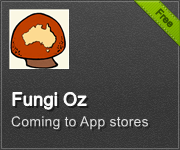 FungiOz app includes several Australian mushroom species where this is the case. Most Amanita species are either downright poisonous or will make you very sick. A slerotium is a fairly solid body of mushroom tissue that can be buried underground and attached to the mushroom's stem base in some way. A notable Australian example is the colloquially named Native Bread which was eaten by Australian Aboriginals as well as by early white settlers. The slerotium in this case can be extremely large and looks rather like a white truffle. It fruits several days after fire or some similar disturbance. Cortina means curtain and is the Mycological term for a web-like attachment between the mushroom cap and its stem. The web fibres can be thick or extremely thin and therefore leave not much more than a stain around the stem of a mature specimen. Often there may just be a discolouration of rusty-coloured spores in place of a ring. Such features identify the mushroom as part of the Cortinarius family, most of which are poisonous to some degree. Web-caps are an extremely large family of fungi and FungiOz app devotes a whole catalogue category to Australian species. 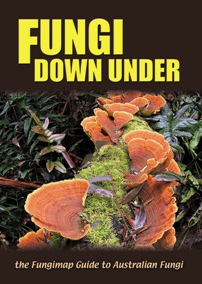 This book is the definitive fieldguide for the 100 Australian species being mapped by Fungi map. Its a snap to report your sightings of these species to Fungimap.